There aren't many places on a runner's body that wearable tracking tech hasn't tried to colonise. But just in case you missed some of the many current tracking spots, we'll list them for you: ears, chest, wrist, lower back, thighs, top of the head, forearm, quads, calves, ankle. There's been a sensor made for every single one. Some hopeful innovators even had a crack at convincing us to wear 80s style tracking sweatbands on our foreheads. Some of these have had huge success while others understandably didn't quite catch on (we're looking at you Moov HR Sweat). However, there's one piece of equipment – or two to be more accurate – that seems a no brainer but has quite remarkably failed to reach its true wearable potential, and that my friends, is the running shoe. Connected shoes just haven't convinced us. We asked the question "where have all the smart shoes gone?" back in 2015. It's now 2018, where even your toaster is connected, and yet we're still lacing up 'dumb' running shoes. So is putting sensors in shoes too much of a technical challenge? Is the market still not ready? Or are the true technological advances in running footwear focusing on other things? We've been looking at what the future holds for our running shoes. The concept of putting sensors into running shoes isn't new. Back in 2012, Nike launched a smart shoe – the Nike+ Training Shoe – that was capable of reading a range of foot-based data including how many times your feet hit the ground, how long each foot was off the ground and where the contact was made. Since then we've seen the Under Armour Speedform Gemini 2 & 3 and the Altra Running IQ follow suit, attempting to popularise form and performance-tracking running shoes. But the truth is these smart shoes haven't really ever taken hold. Nike's Training + shoes quietly disappeared not long after the big marketing fanfare had faded, while Under Armour and Altra's connected shoes haven't really made a dent in the traditional shoe space. At least not yet. Under Armour hasn't given up just yet and, in February 2018, the company released its latest chip-laden shoes the HOVR Phantom and the HOVR Sonic. In addition to some Boost and Nike React-bothering foam technology, each of these shoes comes with a lightweight chip, complete with accelerometer, built into the thickest part of the right-shoe midsole. This can automatically detect when you start running and records a number of key running metrics, including distance, stride length and cadence, without the need for a phone. The data will also be synced to Under Armour's MapMyRun app via Bluetooth when you get home. Then there's Sensoria, which up until now offered real-time tracking technology in the form of sock-worn sensors. In 2018, it's moving this technology on a step, releasing its own smart shoes and pairing three textile sensors built into the sole, which can detect data about the way a runner's foot makes contact with the ground, with a removable, reusable Sensoria Core sensor. There's also a partnership with running shoe brand Vivobarefoot that will see Sensoria's technology built into a model of its minimal footwear to provide insights such as speed, pace, cadence, GPS track, foot landing technique, time on the ground, impact score and eventually, asymmetry and toe engagement. In 2017 we saw the re-emergence of the footpod. Garmin released a new form-tracking footpod and we got excited about the prospect of Shft IQ and Runscribe. We've also seen the rise of arguably the most compelling new run tracker since Lumo Run in the shape of Stryd, another pod that clips to the outside of your shoe to deliver a huge range of form data and finally give runners access to the power output number that cyclists have enjoyed for ages. Right now sensors worn outside our shoes are more popular with runners than shoes that have them built in. And that's not going to change anytime soon according to Angus Nelson, cofounder at Stryd. When it comes to chips in shoes, he says there are a few challenges that need to be conquered. "The primary one is that for a lot of shoe companies their core competence is in making shoes and they each have their own niche – like Hoka has the wide bottoms and Nike does the waffle plates – and this core competence they've had for their entire existence has not been in technology," he said. "I think there's a barrier in finding the right people that have the core competence in doing technology inside of shoes." On the flipside new start up brands who have the technological know-how don't necessarily have what Nelson calls the "tremendous amount of resources" needed to build a shoe brand. "I think that's part of the challenge and that the right expertise hasn't been applied to the field," Nelson told us. I go through four pairs of running shoes every year and so why would I want to throw away everything with the shoe when I can keep the intelligence technology and just swap it out? The blanket advice given to runners is to replace running shoes every 300 miles to prevent injury, but Under Armour wants to take this one step further. The smart chip battery in its latest connected shoes is designed to outlast the life of the shoe. This not only means that it should never stop tracking but the shoe's analytics will also tell you when it's time to buy new shoes. And Under Armour is not alone here, Sensoria's new shoes will carry the same feature. We'll let you decide if this is a clever way to sell more shoes or a handy reminder to help you avoid injury. A regular marathon runner can easily run 30 miles per week in training, that's more than 1,500 miles per year. If you follow the 300 miles rule that means you're looking at around five new pairs of shoes a year. If each time you bought new shoes that meant you had to replace the chips and sensors as well, this could get expensive and wasteful. But that's not how Sensoria co-founder and CEO Davide Vigano sees it going. "I go through four pairs of running shoes every year and so why would I want to throw away everything with the shoe when I can keep the intelligence technology and just swap it out?" said Vigano. "The way we think smart shoes of the future should be built is that they will have some sensing technology embedded in the shoe but users will be able to snap on another piece of micro-electronics – think of it like a super small Fitbit 3.0, which we refer to as the sensory core engine." This same "brain", suggest Vigano, could be moved between different shoes, for example a road or trail shoes, or onto socks or even apparel to provide a consistent method for capturing a range of running dynamics and biometrics. What if we told you that the way you'd describe yourself as a runner, might not match the runner you really are? And that perhaps the ideas you've created in your own head about how you run might be holding you back, or even worse contributing to injury? Well, according to one of Nike's leading shoe designers, Bret Schoolmeester, this is something the company is looking at with a view to having shoes that might be able to unlock new and useful truths about how we really run. "People really want shoes to help them avoid getting injured but we know the vast majority of running injuries come from training mistakes and that there are plenty of examples of runners' inability – not by any malice – to self diagnose correctly," he said. "There's a great study that Martin Shorten did where he asked people if they were heel, forefoot or midfoot strikers and then actually video taped them in a full marathon and revealed that what they actually did was totally different. "It makes me think of things like Netflix or Spotify that can actually watch my behaviour and know me better than I would describe myself. I might want to project a certain image of myself so I would only tell you certain music that I listen to. But Spotify can see what I was really listening to and they serve me better targeted music because of it. "I think there's definitely room for that to enter the world of sports and of product, so we can continue to serve better ideas. Netflix and Spotify are an example that we use among ourselves to say how do we get there for our product." Your feet and biomechanics are as unique to you as your fingerprint… A surprising number of us even have a variation between the size of our right and left foot and it's not uncommon for that to be as much as half a shoe size. But the vast majority of the shoes we can buy right now are made for the masses. That's not going to be the case for long because a combination of new materials, smarter production technology and the need to reduce the environmental impact is moving us closer to a world where 3D printed, bespoke shoes are a reality. 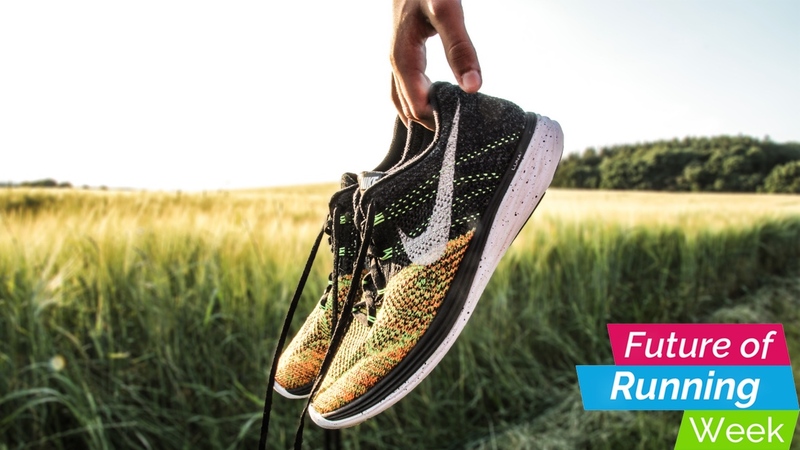 Imagine walking into a shop, having a 3D foot scan and a motion capture assessment to capture your individual run print, then having all that info built into your own bespoke running shoe that's delivered in days. That time is coming, not yet but soon. Adidas is already testing the technology and Salomon has recently developed S LAB/ME:sh technology where the lower part of the shoe – including the drop, cushioning and the outsole – can be customised to work with your biomechanics. It's not entirely beyond the realms of possibility that sensor-laden shoes, powering artificial intelligence, might even be able to take our running data and use that to ensure our next pair of shoes has adapted to the way we're actually running now as opposed to how we were running when we bought our last pair of shoes, before we went through that training programme that improved our running form.